Depart Manila at 2pm and arrive in Shenzhen via Flight no 2P056 (4.00pm). Ipon arrival, meet our local tour representative and proceed to Windows of the World (entrance ticket included) and experience the night show and fireworks display. After that we will check in at Ambassador Hotel. Breakfast at hotel. We will start our day journey by having a transfer to Hong Kong by train, followed by Hongkong City Tour. It will be free and easy leisure for you to do your own shopping during the afterrnoon. Accommodation at Tatami Hampton Hotel or similar class. After breakfast at hotel, we will begin our full day Disneyland Tour. Entrance ticket and roundtrip transfers will be provided. 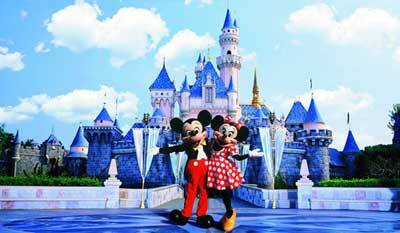 It will be free and easy leisure for you to explore the wonders of the Disney theme parks. Accommodation at Tatami Hotel or similar class. After breakfast, we will take the morning train for transfer to Shenzhen. While at Shenzhen, we will tour around the city and shopping. We will also visit some popular tourist attractions such as the Lotus Hill Park, Chinese Art & Craft Center and Chinese Tea House. In the afternoon, we will transfer to Shenzhen Airport for flight back to Manila. Full package includes air tickets, all the hotel accommodations, meals and sightseeing as specified in the itinerary above.